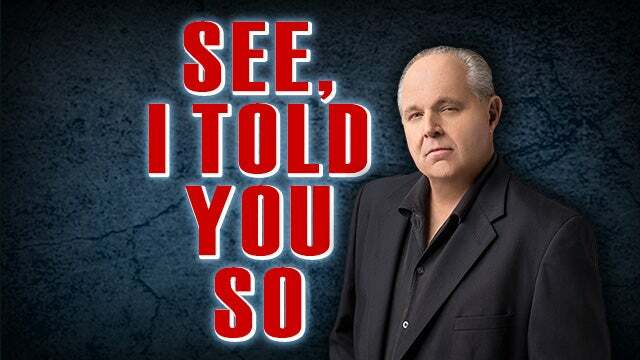 RUSH: Mr. Snerdley came in to me today and said, “You know, you’re gonna have to stop saying that you predicted it, because it’s gonna get so redundant you’re gonna start irritating people. You could say it every day.” No sooner, no sooner — in fact, let’s grab audio sound bite number 1. I want to remind you what’s going on. Welcome to the Rush Limbaugh program. We’re here and ready to go for three hours. Telephone number, 800-282-2882. In the second hour of the program yesterday, in the monologue segment — that would be the first segment — I told you for 10 minutes how despondent and glum the faces on CNN were. For two years they had spent every day and all day and multiple times a day assuring themselves and everybody Trump was going down. He was gonna go down because Mueller was gonna produce evidence of collusion. They were gonna prove Trump was a traitor and all that. And then yesterday William Barr came along and took the ball away from ’em, and they for the first time in two years are on defense. We are on offense. The glum, the depression, you could see it on their faces. They had taken everything they believed in away from them with one comment, “Yes, I think there was spying on the Trump campaign.” And I told everybody. “But don’t get used to it, because they’re going to come out of it. Tomorrow they will have something that rejuvenates or, here, listen to me warn you. This is in the third hour of the program yesterday. RUSH ARCHIVE: They’ll come out of it tomorrow. They’ll have a whole new attitude tomorrow to deal with this. And it’ll involve Barr being a phony, maybe unqualified, whatever they have to do to right the ship. But today you can see this blank, stunned disbelief, depression, despondency, disappointment on their faces. Not constantly. You have to know how to look at it. Now you know what they’ll do. They’ll switch on a dime to new Trump scandals. RUSH: Is it too much to ask if maybe it’s a big coincidence that, all of a sudden, authorities found their way inside the Ecuadorian embassy in London and pulled out of there Julian Assange? Who, by the way, they used to love Julian Assange, folks. We’ve got the audio sound bites coming up. The Drive-By Media, the Democrat Party used to love this guy. But just to illustrate, here’s CNN after having done a 180, they can barely contain their excitement today. 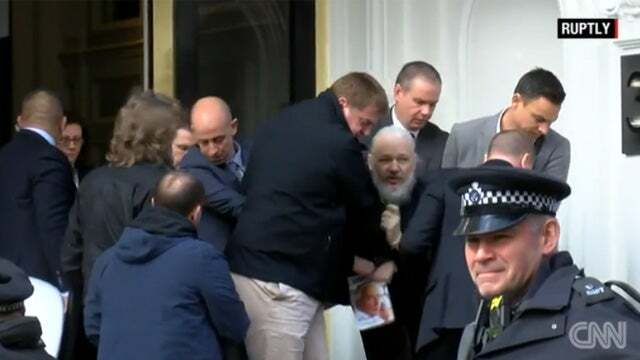 CAMEROTA: This is the shot of him being taken from the Ecuadorian embassy by British police. BERMAN: Oh, my god, look at him. The beard. I have not seen him looking like that. Clearly not being taken willingly. He’s being dragged to the police van. CAMEROTA: You know, that’s what they call the perp walk or the grab shot. And that is a fascinating one because look at how many people it’s taking to take him down. He’s not going willingly. He looks like Rip Van Winkle. He has aged more than seven years since he’s been in there. And it’s just fascinating to watch this. Let’s do see again. BERMAN: He is not walking out voluntarily. He is shouting, which just shows you his position in the world. To an extent, it is the governments of the world, minus Russia, against Julian Assange. RUSH: Oh, yeah, they’re rejuvenated, folks. They’re back to life. They’re back to being alive. They’re back on the path of getting Trump. So excited is CNN, here is a montage that they’re playing every 10 minutes. THE PRESIDENT: (echo) (10/10/16) This just came out. Wikileaks. I love Wikileaks. (10/12/16) This Wikileaks stuff is unbelievable. (10/31/16) Another one came in today. This Wikileaks is like a treasure trove. (11/4/16) Getting off the plane they were just announcing new Wikileaks. And I wanted to stay there, but I didn’t want to keep you waiting. (11/4/16) Boy, I love reading those Wikileaks. RUSH: Oh, they can’t get enough of this, folks. They are so transparent. They are so predictable. And I want to put all of this in perspective for you. Great to have you with us. As I say, El Rushbo here behind the Golden EIB Microphone. You have to see how the Democrats have gone after Barr since his testimony yesterday. Again, not hard to predict. 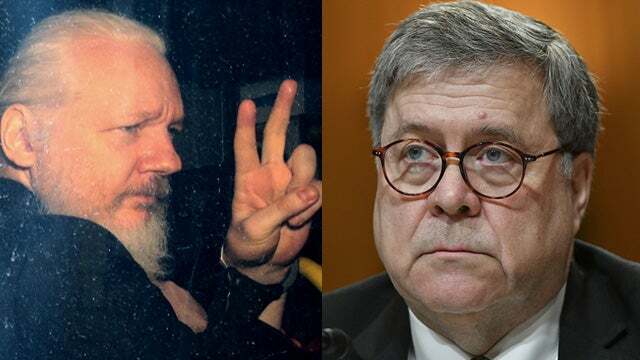 You knew it was going to happen because yesterday William Barr took the ball away from them and for the first time since all of this began, they are on defense, and they can see where this is going. They can see with themselves as the targets where this is going. Here are some headlines that I put together just in a flash this morning. Can I ask a question? Barr announced an investigation yesterday, right? He said we’re gonna look into the investigation, how it began, where it began. Because he does think that there was spying on the Trump campaign. And there was! They got a FISA warrant renewed three times. There was spying on the Trump campaign! It’s not even arguable, folks. The thing is that there was even more spying than the FISA warrants. They had informants. The FBI attempted to get ’em hired and planted inside the Trump administration. It’s now been confirmed by people in congressional testimony. Now, my question is this. Aren’t all of these Democrats — Schumer, Pelosi, Pencil Neck, Nadler, James Clapper, Toobin, F. Chuck Todd — are they not obstructing justice here? They’re criticizing the investigator. These clowns are already obstructing justice by their own definition. I mean, weren’t we told that Trump obstructed justice when he criticized Comey and then he criticized Mueller and called it a witch hunt all day? Where are the calls now for investigations of Schumer and Pelosi and F. Chuck Todd and Nadler and Clapper? Because it sure looks like a conspiracy to obstruct justice and prevent an investigation, if you ask me! It looks like these people are hell-bent on doing everything they can to stop this investigation (i.e., obstruct it) and further to discolor it and disqualify it — and, by the way, these are not empty threats. Schumer and Nadler and Schiff control the DOJ’s purse strings. As members of Congress they’re in charge of allocations, spending authorizations. So how can anyone doubt that we are witnessing a clear attempt to stop Barr’s investigation and to obstruct justice “in plain sight,” as Nadler and Schiff might say. Now, you might think I’m trying to be clever. You might think I’m trying to be funny. Maybe so. But I’m also dead serious. This is exactly the kind of thing they said Trump was guilty of obstructing. This is the exact kind of thing they were hoping Mueller would find Trump guilty of. They’re asking Barr to step down. Did Trump ever ask Mueller to step down? Did Trump ever fire Mueller? No! They’re demanding that Barr not even start this. They’re demanding that Barr pull it back. Schumer is demanding that Barr take it back. “Barr Must Retrack ‘Spying’ Shocker.” This is a clear attempt to obstruct the investigation. This is a clear and open, in-front-of-our-eyes attempt to make sure this investigation never gets going. I wonder what are they so worried about? Didn’t they also say, “What’s Trump worried about? If there wasn’t any collusion, let it happen! If you’re not guilty, what are you afraid of?” I’m in favor of throwing every device they used right smack-dab between their eyes. I love seeing these people on defense. They need to stay on defense because everybody involved here knows exactly what happened. The media people — F. Chuck Todd, Jeffrey Toobin — know they were complicit in this. They agreed to be complicit because they were assured it was a slam dunk. They were going to get Trump. They were going to return Trump to the private sector. They were going to overturn the election results of 2016. They were gonna get rid of Trump. They knew it. They were gonna succeed in driving his approval numbers down so low that Trump would have to retire. Whatever, however, they were confident they were gonna be able to do it. And why not? They have been able to take out anybody they wanted to take out in the past. They’ve been able to destroy anybody else they’ve wanted to destroy. So Trump would be an even easier target, ’cause he’s such a buffoon, because he has so little class, because he’s such an ogre. It’s one of the greatest misjudgments and miscalculations in the history of class warfare. The elites still haven’t got any idea what hit them and what they’re up against, and now they’re making the mistake of thinking they’re running the show. They have been reduced to the size they actually are — tiny — and everybody can see it. Now, the strategy here is clear. 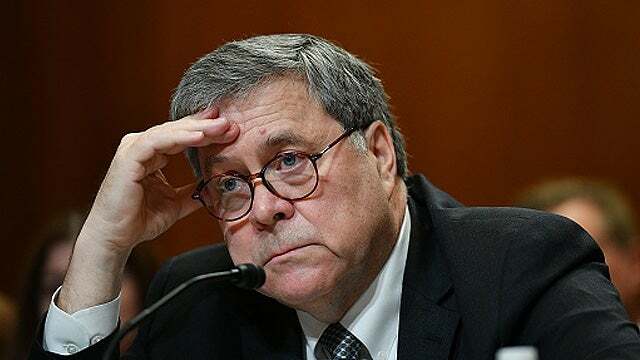 All of these attacks on Barr from the Democrats and the media are a full-court press to discredit any investigation into this silent coup against Trump even before it begins. I’m still struck by the things I saw yesterday. It took them the rest of yesterday and overnight — or into the night, not the full overnight. They were shell-shocked yesterday, folks. Members of Congress, the media, they were shell-shocked when Barr admitted… Well, he didn’t admit. When Barr proclaimed that he thought there was spying on the Trump campaign. What happened yesterday is the kind of thing — it’s an unwritten rule — that never happens inside the Washington establishment. It just doesn’t happen. The establishment does not turn on itself. Barr has always been considered a member in good standing of the establishment, by the way. This needs to be pointed out. He’s a member in good standing. He’s served in positions of authority and honor. He’s been attorney general a couple of times. He’s been the legal counsel for the Department of Justice. He has held significant positions in numerous presidential administrations. He’s a member in good standing of the establishment, the ruling class. He turned on that ruling class yesterday. And, you know… (sigh) I am confident that he’s serious. I’m confident that he is really — and for a long time has been — really disturbed by what he has seen. I think he reveres the Department of Justice. I think he reveres the (if you can call it this) business of the law. I think he holds it on a very high pedestal. I think he recognizes the rule of law, the enforcement of law, and the glue that is the law, is essential to this country remaining put together as founded. I think he was, like all of us, genuinely alarmed, frightened, scared, angry (you add it all up) about what was becoming of the law and the Department of Justice, as they attempted to run a coup. They attempted to overturn… A bunch of unelected people attempted to overturn election results simply ’cause they didn’t like the guy who won on the basis of class! I mean, look at the Never Trumpers. The conspiracy theory was what fueled this bogus investigation the past two years! The investigation of this coup is not a conspiracy theory. It’s the first thing that’s real in the last two years about this! Trump-Russia collusion was the conspiracy theory. Trump-Russia collusion was a put-together, assembled conspiracy because there has never been any Trump-Russia collusion. Barr’s claim that Trump was spied on is a conspiracy theory? No. (chuckles) At the bare minimum, they went out and got FISA warrants and renewed them to spy on the Trump campaign. We know that Carter Page had his phone tapped. We know that Trump Tower was probably surveilled and that’s why they closed up shop and moved. Let me take a break. We’ll come back, continue. You know, folks, I’ve been… Since there isn’t any real journalism out there anymore, I have assembled some questions that I think real journalists would be asking if real journalism still existed.